Winston Churchill was no fan of vermouth. When mixing a martini, the statesman is rumored to have poured the requisite dose of gin in his cocktail shaker and then gazed across the room at a bottle of vermouth, deeming this sufficient interaction between the two ingredients. Countless bartenders have echoed Churchill’s habit, using eyedroppers and atomizers to ration ever-decreasing amounts of vermouth. But while most Americans consider vermouth something best avoided while mixing a martini, this fortified wine is a popular aperitif in much of Europe, where it is enjoyed by the glass, not by the drop. Vermouth originated more than two centuries ago in the ancient kingdom of Savoy, which covered much of northwest Italy and parts of southern France. To improve the flavor of the region’s then-inferior wines, winemakers added herbs and spices, including cardamom, allspice, marjoram and wormwood—vermud, in Old High German, which was more famously used in absinthe. The first branded vermouth was a spicy red variety made by Carpano in Turin, Italy, in 1786; 14 years later, in the Mediterranean town of Marseillan, Joseph Noilly introduced the first French dry vermouth. Today most vermouth is produced using white wine flavored with herbs and spices and fortified with neutral spirits. 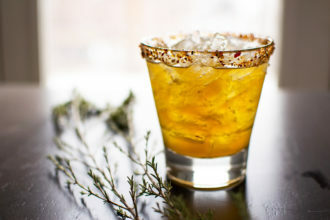 Dozens of herbs and botanicals may be used, creating a carefully balanced, layered flavor that ranges from bitter to spicy sweet. The two principal types are the white and dry French style and the red, sweet Italian style. While California-based Quady Winery has created exceptional vermouths in both styles under the Vya label, the most prominent vermouth houses are still in Europe. Noilly Prat makes an excellent French vermouth, which is aged for one year in oak casks stored outdoors, giving the finished product a smooth, vibrant flavor that is indispensable in a classic martini. Carpano still produces a distinctive bittersweet vermouth called Punt E Mes, but most Italian-style rosso vermouth is made by industry giant Martini & Rossi, and by Cinzano, another Turin-based company. Rosso takes its color from caramelized sugar and is popularly served over ice with a slice of orange or lemon; it’s also an essential component in a Manhattan or a Negroni. Cinzano and Martini & Rossi also make bianco, a sweet white vermouth best enjoyed over ice with a splash of tonic or soda. Vermouth is a fortified wine, not a spirit—once a bottle is opened, its flavor quickly changes. “People buy a big bottle and leave it on the bar—they don’t realize it has a shelf life,” says DeGroff. “Three months later they put it in their martini, and the drink tastes awful.” It’s best to buy vermouth in small bottles, refrigerate it and use it within a couple of months (a vacuum seal may extend the life). But don’t discard the older vermouth—it’s useful in food recipes that call for wine, and it’s excellent for deglazing a pan. A blend of smoky mezcal with earthy, bittersweet Cynar.